Thanks for a great report of this event, Nick! It was great to meet you in person. The lamb stew was excellent! It was great to finally meet you in person as well, Worshipful Brother Joseph. That is one perk of TMS, making electronic connectionsion the hopes of meeting in person. I really must make my way to Madison. Is that picture of the Master standing in the East supposed to be in an Emulation Lodge? Where's the altar? Please remember "English" is not the same as "British". There are no Emulation Lodges in Scotland as best as I can tell. There was an altar, I just didn't take a picture of it. As to the use of the term British versus English, I would rather see the use of British. Emulation is practiced in Wales, the Isle of Man, and Cornwall which is obviously separate from English proper. 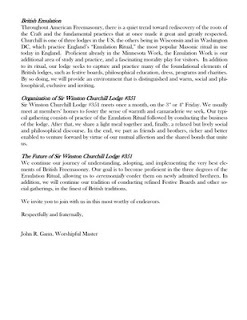 I'm not sure if any Lodges in GL of Scotland practice Emulation but as that GL allows Lodges to practice what they want, I wouldn't be surprised. 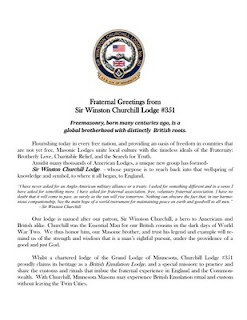 British is a much more inclusive for these other non-English areas within the jurisdiction of the UGLE.